陈刚, 张晓明, 杨桂芳, 韩刚, 边军, 杨亚南, 卓胜广. 辽西地区下白垩统九佛堂组沉积与有机质发育特征[J]. 地质通报, 2019, 38(2-3): 426-436. 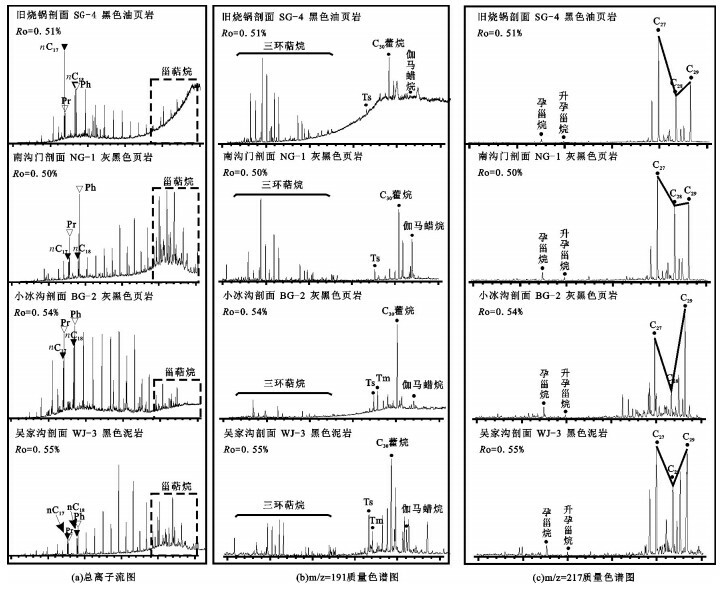 Chen G, Zhang X M, Yang G F, Han G, Bian J, Yang Y N, Zhuo S G. Sedimentary and organic matter characteristics of Lower Cretaceous Jiufotang Formation in western Liaoning Province[J]. 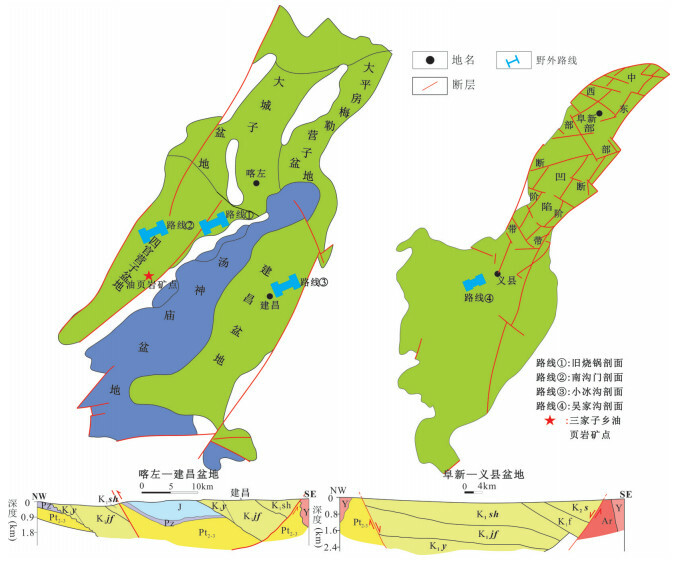 Geological Bulletin of China, 2019, 38(2-3): 426-436. Abstract: Lower Cretaceous Jiufotang Formation is one of the important source rock stratigraphic horizon in Mesozoic strata of western Liaoning Province. 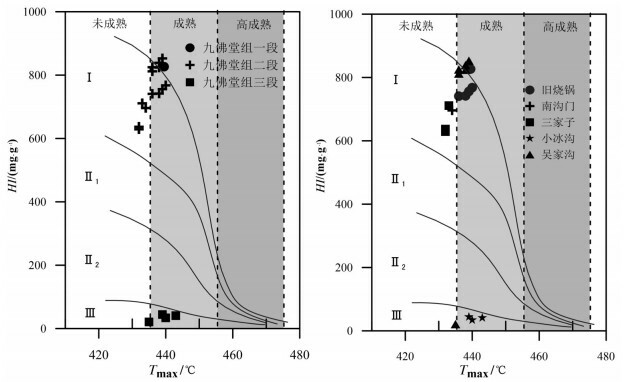 It is widespread in Jianchang-Kazuo Basin, with thickness of 206~2118m, but is relatively thinner in Fuxin-Yixian Basin. 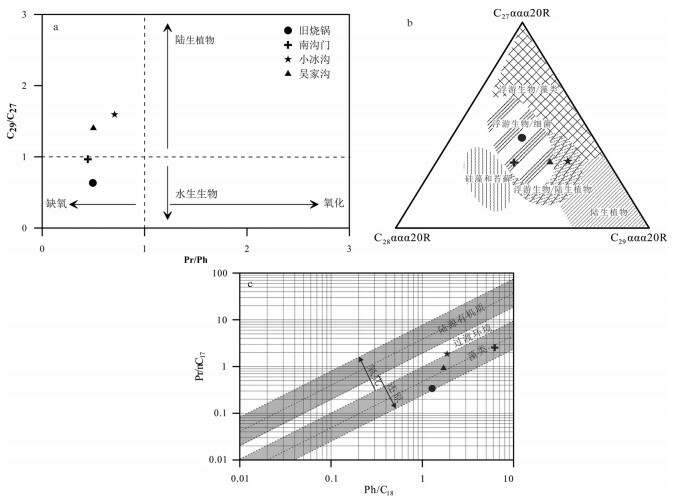 Organic geochemistry analyses indicate the two basins have both developed good to excellent source rocks characterized by good kerogen type and low maturity. 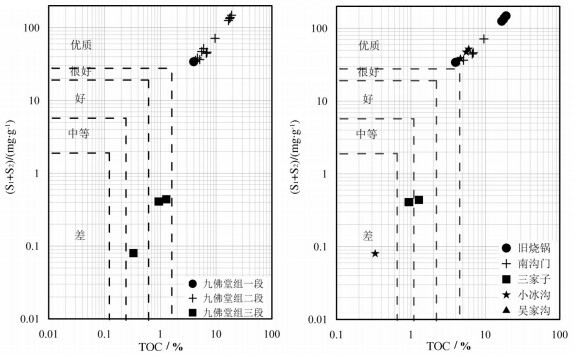 The second section of Jiufotang Formation, which was formed in flunctuating profundal facies, is optimistic source rock horizon with average TOC of 9.5% and kerogen ofⅠtype. The first and third sections of Jiufotang Formation, which were formed in fluvial-lacustrine facies, have relatively poor source rock development environment due to shallower water body. The biomarkers analyses indicate that source rocks in the second section of Jiufotang Formation were developed in a clay-rich reducing brackish lake. The preliminary genetic analysis indicates that the development of these source rocks was attributed to good conservation condition from chemical stratification of lake water body and relatively high primary production. 张树东. 建昌-喀左盆地油气显示与油源分析[J]. 辽宁工程技术大学学报, 2008, 27(s1): 48-50. 郭强, 王宇林, 钟大康, 等. 喀左盆地油页岩资源勘探前景[J]. 新疆石油地质, 2011(5): 473-475. 魏恒飞, 王宇林, 王威, 等. 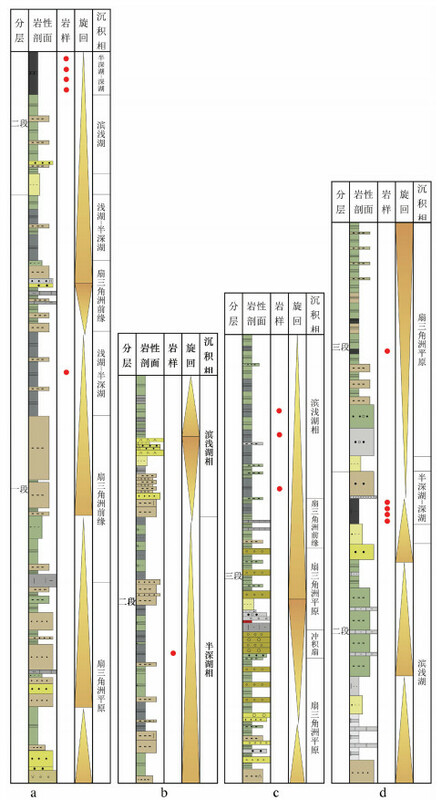 喀左盆地九佛堂组沉积特征及演化研究[J]. 沉积学报, 2009, 27(2): 273-279. 魏恒飞, 王宇林, 王威, 等. 喀左盆地九佛堂组露头高分辨率层序地层划分[J]. 沉积学报, 2009, 27(6): 1109-1115. 张亚明, 高玉娟, 何保, 等. 建昌-喀左盆地中生代构造演化[J]. 辽宁工程技术大学学报, 2005, 24(6): 20-22. 黄庆华, 马寅生, 李永贤, 等. 阜新-义县盆地构造演化及应力场光弹性模拟分析[J]. 地球学报, 1991(1): 21-34. 李亚平, 董国义, 范国清. 辽西中生代含鸟层及上下层位的划分和时代[J]. 辽宁地质, 1998(3): 175-184. 卢双舫. 油气地球化学[M]. 北京: 石油工业出版社, 2008. Erik N Y, Özçelik O, Altunsoy M. Interpreting Rock-Eval pyrolysis data using graphs of S 2, vs. TOC:Middle TriassicLower Jurassic units, eastern part of SE Turkey[J]. Journal of Petroleum Science & Engineering, 2006, 53(1/2): 34-46. Dahl B, Bojesen-Koefoed J, Holm A, et al. A new approach to interpreting Rock-Eval S 2, and TOC data for kerogen quality assessment[J]. Organic Geochemistry, 2004, 35(11/12): 1461-1477. Langford F F. Interpreting Rock-Eval pyrolysis data using graphs of pyrolizable hydrocarbons vs. Total Organic Carbon[J]. AAPG Bulletin, 1990, 74(6): 799-804. 侯读杰, 冯子辉. 油气地球化学[M]. 北京: 石油工业出版社, 2011. Peters K E. Guidelines for evaluating petroleum source rock using programmed pyrolysis[J]. AAPG Bulletin, 1986, 70(3): 318-329. Brassell S C, Eglinton G, Maxwell J R, et al. Aquatic pollutants[M]. Oxford: Pergamon Press, 1978. Peters K E, Peters K E, Walters C C, et al. The biomarker guide[M]. Cambridge: Cambridge University Press, 2005. Bohacs K M, Carroll A R, Neal J E, et al. Lake-basin type, source potential, and hydrocarbon character: an integrated sequence-stratigraphic-geochemical framework[C]//Lake basins through space and time: AAPG Studies in Geology, 2000, 46: 3-34. 彭平安, 张文正, 杨华, 等.鄂尔多斯晚三叠世优质烃源岩发育的盆地化学动力学背景[C]//全国有机地球化学学术会议. 2009.